Leadership, when done well can allow you to move mountains, both personally and professionally. It allows us to be the master of our fate as well as the victor or our own lives, day in and day out. 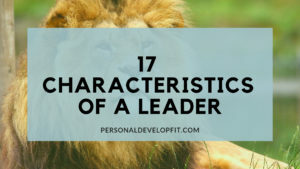 But you may be wondering what the qualities of leadership are and what it takes to truly become and be seen as a leader. Well below I go into the personality of a leader as well as what leadership really is! When it comes down to it, being a leader is being a coach. To yourself as well as to the people around you. It is becoming a master of our own environment and utilizing everything we have around us and in us to achieve maximum results in our lives. It allows us to get things done and create a life that others only dream of. It is a way of life that is ingrained in one’s personality. Which the great thing is that the qualities of a leader can be developed, allowing anyone to become a leader. A great leader creates a vision for their future as well as portrays that vision so passionately and effectively, that people natural want to help them attain that vision. A good leader motivates people and is so intrinsically motivated that they simply have a vision that pulls them, they no longer have to push themselves to get motivated. They are also great servers of the people, they support and show that they care for the people around them. Through the trait of empathy as well as a showing people that they truly want the best for them. Which to me, is the highest form of love. Some people are born with more of a genetic predisposition to be leaders and others simply develop it because of desire or need for reaching higher levels in their life. Regardless, once you learn to live out the qualities of a leader and they become you, you won’t be swayed any longer. You will be the leader of the heard and dictate every action of your life. Below I talk about those qualities and what they encompass and what makes a good leader. Great leaders are self-aware and genuine. Good leaders are aware of what their strengths and limitations are as well as very aware of their emotions. They aren’t afraid of their mistakes and don’t hide them, trying to look perfect in the public eye and that becoming self-actualized is done on a daily basis and a life long pursuit. They lead with their heart and with empathy and are mission driven. They put their mission ahead of self-interest and they think long term. This has to do with the realm of diplomatic leadership in which one seeks to build trust and respect as they know that they cannot lead unless they have this. They develop a way of knowing just how far and how much they can push people around them to reveal to them their inner gifts and strengths. A diplomatic leader operates from the highest level of ethics. They bring a high level of integrity as well as safeguard to their personal and professional lives. Tony Robbins talks about how the ultimate sign of a leader is someone who lives life on their own terms. They can be mothers who lead their children and household, a person who decides to become self employed because it makes me happier. It is also the link between living the most extraordinary life you can live. They know their morals and what they want out of life right now and have a vision for their life and how they are going to go about creating that life. Leaders are always hungry for more. To accomplish more, to be more and to become more. They don’t operate off of quotas, the operate off of their potential. Whether they are at the bottom of the ladder in a company or the CEO, they always do more than what is being asked of them. They do this because they don’t want to just meet quotas or do the bare minimum to scrape by. They do this because they know that it is the only way to reach their full potential. Leaders who do more than what is asked of them become more because they are demanding more of themselves. Sooner or later, these higher standards will show up in their life in a big way, in every arena of their existence. They have a bottomless pit of hunger where they never allow themselves to become comfortable. They keep growing and integrate the concept of constant and never ending growth. So how can we adapt this concept of continuous and never ending growth? Well we simply need to do two things. This is to keep learning on a daily basis. Listen to audios, read positive books, learn more in your field. Also look at life as a growing experience. Good and bad experiences are an opportunity to grow from. Once we adapt a growth mindset and integrate it as much as possible throughout our day, we will commit ourselves to constant and never ending improvement. It will become an attitude that is ingrained in us where we start to seek growth more readily and actively. This will also keep us out of seeing ourselves as victims, which is something that every single great leader is not. Leaders know how to influence. Without influence, you cannot get people to buy into your vision and inspire people to do their best. Without it, you cannot leave a massive legacy. Some of the best leaders in the world have mastered the power of influence. A great article by Harvard Business Review talks about the key to being influential talking about the main factor being that it is to project a feeling of warmth to those around you. They did a study and showed that leaders who rated low on likability have a one in 2000 chance in being seen as effective. So cultivated a feeling of warmth is crucial. The opposite of dictatorship, which in my personal opinion is simply showing people that you truly care and believe in them and in your vision. The article talks about how we need to build a foundation of trust which will allow people to adopt our values, culture and overall mission of the company or vision. If we don’t do this, we run the risk of people complying in front of the leader, but not behind his or her back. Speak naturally to people, avoiding using big words that only seek to impress. Keep it professional but at the same time informal that is genuine, which will build trust. Identify your audience and those who need the most amount of persuasion. Learn to anticipate questions that may be asked by those who are the big decision makers. Cater to the audiences you are looking to persuade by learning to speak their language so to say. Another article called “Persuasion and How To Influence Others” talks about how we should seek to employ reciprocation whenever we can. People feel obligated to give something back when we give something to them. They will feel a need to repay the “debt”. Knowing this, we can give people small favors, information and concessions in order to get back from them what we are looking to, which can help our influence levels. Also, we can easily start to influence by becoming an authority in our space. Once we start taking steps to become an authority like hitting bigger numbers, staying later and arriving early or moving up in position, we can begin to build the authority we need to influence people a higher level. Lastly we can influence others by simply being likable and friendly. Creating a sense of caring for another is key to influence. People will go to the end of the earth to feel loved, and if you make them feel this way, you can influence them in a massive way. Being innovative is crucial to leadership. Both being innovate as well as promoting it within your team. There is a great article called Leadership and Innovation that actually highlights an article done by Wall Street Journal talking about how a great way to how we can lead with innovation by simply encouraging small wins and the big ones will follow. Which we often see innovation as something we need to cultivate in a big way, like a huge massive invention that happens only once in a blue moon. So when we encourage small and little wins, we encourage a culture around us that allows people to feel comfortable enough to come forth with any and all types of ideas. Empowering people around you and fostering a sense of equality. Two awesome characteristics of leadership. Analytical – Clear thinking leaders who employ rigorous analysis and encourage these small wins from an analytical perspective. Structural – These leaders pare practical. They have a love for predictable outcomes. Social Leaders – Great with relationships and creates a vibe of innovation throughout their culture. Depending on which type of leader you are, you will foster different cultures with your leadership style. Knowing what type you are will allow you to communicate to your team and people around you how you think and act and what type of environment you want to build as far as idea presentation goes. For example we are in a group and we witness something that looks alarming to us, like someone looking like they may need medical help. We look to the group for how they are reacting and formulate our response partially based off of how they are acting. It can also apply to something less intense, for example when all of your friends are talking about how great a new movie is, it makes you want to see it, even if you weren’t remotely interested in it in the first place. So if we are interested in influencing others, we can do so in a big way by employing social proof. But how do we do so? Well first off before you and I talk about that, it is imperative to know that influence through social proof or any type of influence is never done by intimidation. Now that we got that out of the way, let’s talk about how we can use social proof in the workplace to solidify or spot as a leader and influence people around us. Getting a stamp of approval from a credible expert in your field. In the press, big blog post or even a social media mention and even a celebrity mention or your product or service. These mentions can build epic amounts of social proof allowing you to have a better platform to influence on. Getting Certifications – Things that show how knowledgeable we are though third party endorsements. Social Shares Counts on your site showing how many people have shared your work, pinned your pins or tweeted your work, etc. Yelp reviews. For this one, you can offer people something in exchange for their positive yelp review to up your social proof using this tactic. You can also survey these people to create a stat percentage of those who would buy or work with you again or even displaying the number or orders or people you have helped. Social proof really comes down to increasing positive perception of what you want to amplify, in this case ourselves. The more we can look good in the eyes of others, the more eyes of others we will look good in. Good leaders are those who can make decisions fast. Time is of the essence. They are good under pressure and integrative high levels of decisiveness daily. And if they decision they make is the wrong one, they take full responsibility for their actions and take action on course correcting to make the most out of the bad decision. They are not afraid to make a decision as they know indecisiveness will cause more problems and more fear, keeping them from forging ahead for themselves and the people they lead. They bring calmness to scenarios and situations through their decisiveness as they know most people have trouble making decisions. This brings a sense of peace to the people around them as they have a feeling of having a captain who is guiding their ship. Gather as much information as you can. Be proactive instead of waiting for htings to happen. Mull over the options and get outside perspective through people or articles online. Create a pros and cons list can lead to an “a-ha” moment. See yourself going down each road of making each of the potential choices as well as how your life will look for both. This can help you make the correct decision. Consider whether the decision you are going to make has been similar to those that have been bad decision in the past or have led to bad outcomes. Then employ a decision that is the opposite. Take insecurities out of the equation and don’t let them drive decisions. Think logically and leave emotion out as much as you can. People value and admire decision makers. It may be one of the greatest characteristics of a leader and allow you to stand out in your life, professionally and personally. At the end of the day, we should simply ask ourselves what is the worst possible scenario that can happen if we make said decision. If the positive aspects outweigh the negative ones, then make that decision immediately. The more we become more decisive, the more we will naturally become more decisive. It will simply become a subconscious habit to do so and course correct as we go. The key to become a great and effective decision maker is to not go back on your word after you made the decision. For example we can start utilizing this tip by deciding something simple like where to go for dinner and what movie we are going to see. Then not going back on seeing a different movie instead or going to a different restaurant then we originally decided to go to. Good leaders create certainty when there is none or little. Removing Obstacles – We need to stop trying to do everything by ourselves. Asking for help with tasks that we truly need help we can put in all our energy into meaningful tasks that further our ability to lead and been seen as a leader. Mindful Breathing – An ancient technique to quite our internal chatter. Harvard studies have shown that mindfulness helps leaders tackle problems with more creativity and learn faster along with cut down on anxiety levels. Reflect and Adjust – Re-framing our mindset around failure is crucial. Seeing it as learning experiences can help us to see things in a more positive light. It will allow us to lead better because we will adjust better and create better strategies that build on our failures, not let them hold us back. We can use the power of reflection through the act of journalism. Good leaders will encourage you and inspire you to do things that you may have not thought you were capable of. They believe in their people and because of this, they are able to influence people to do great things and believe in their vision. This creates a team of people who work together for the greater good and it all starts from the simply act of believing in the people around you. Good leadership is displayed by seeing talents in people and encouraging them to run with those talents. As well as believing enough in them to where, if they work for you, you trust them enough to run with projects without putting your word in too much. Good leaders make others feel as if they have the same amount of power as they do, if not way more. Henry Ford was known for being this way. He simply stated that he would employ people who were smarter than him, that was the key to his success and the success of Ford Motor Company. They inspire new hope in people when they are down and out. Allowing them to get past these feelings and see a better future. Focusing On Positive Change – Create change that helps us increase efficiency and/or simplicity, decrease time required to do things and improve structure. Develop More Leaders – Success is not measured by how many people you have the lead over but how many leaders you create out of exercising your leadership role. Darren Hardy talks about how this is the main quality of a 21st century leader. They cultivate the feeling in people that allows them to see themselves as leaders and become one. Utilize Time Management – Leader maximize time efficiently. If a meeting is running late, what can you be doing with that time so you aren’t just wasting it waiting for the meeting to start? Also think about it from other peoples perspectives. If we are late, how much is our tardiness costing our co-workers or clients we are meeting up with. It is imperative to manage time and always be on time. Another great article on dynamic leadership talks about some other tips on becoming dynamic leaders. It talks about how we can also simply learn to become better leaders by leading in a bold way but that doesn’t bully others. A great way to do so is to be cognizant of the message we portray and how the message is being received by our audience. Simply taking the time to think about what we are saying. If something we are going to say would offend us if it was being spoken to us, then we should refrain from saying it. A couple of other tips to develop better leadership skills is to integrate a good sense of humor into delivery. It shows that we are authentic and not simply just polished and rehearsed. Also we should increase our levels of humbleness to decrease the odds of looking arrogant. Also, we can become better leaders by gathering as many facts as we can before making the decisions we need to make. This will allow us to make more sound decisions and reflect the fact that we are made for the leadership roles we occupy. Lastly, we need to embrace our fears of failure and create fuel out of it that pushes us towards the things we want to achieve not stop us from moving forward. Strategic people are able to great connections between plans, ideas as well as people which others imply cannot see. They use the power of thinking and set out times to actively think about ways they can create these connections that others don’t see. It doesn’t happen by accident. They use both the method of divergent thinking where we look at the big picture and create ideas off of as well as convergent thinking in which we rationally arrange those ideas. Good leaders can easily switch between these two thinking styles and do so often. Then they harness the power of execution and execute a plan of action to integrate the ideas they have created from divergent and convergent thinking. Responsibility Distribution – Good strategic leadership pushes power throughout the organization which empowers individuals of all levels in an organization to make decisions. This creates a collective resilience to a company or organization and allows leaders to see what happens when they are risk taking. Support Innovative Thinking – Strategic leaders offer multiple avenues for people in their organization to raise ideas. This creates a culture of innovate thinking to the organization. This can be done through cross-functional forums or apprenticeships. Hiring For Transformation – Strategic leaders know the power of hiring the right people for the their organizations to transform. The put new applicants that will test them to specific real life situations and delve deeply into how they performed in the past. They get to know their psyche and abilities as well as test out their levels of empathy. Good leaders are charming and charismatic. They know how to captivate their audience and the people they are leading. There is a great article that talks about the 7 compelling traits of a magnetic leader. It talks about how compelling leaders are selfless people in which they make sacrifices so that others can advance. True essence of leadership is serving others as well as simply being a giver. They are also strong communicators and don’t care if speaking their mind makes them unpopular. The believe in their vision and aren’t afraid of showing people what they believe in. They know that the people that they will end up leading are people who buy into their vision wholeheartedly and those who don’t are simply not meant to be on the journey with them. They have a charm that inspires people to devote time to their vision. They believe in their vision so much with vivid imagination that people are compelled to help and follow them. Lastly, one of the great attributes of a leader is resilience. They know that everything isn’t always going to go as they planned it to. They forge ahead in good times and bad times, which shows the people around them that they are in it to the end. Not just when times are good. Reverse engineer a problem. Create a vision in our head of the perfect scenario then go back and construct the decisions it will take to manifest it in the world. List out obstacles first. Jot down a list of things that can get in our way then approach the issue in a more comprehensive manner. They find multiple solutions by thinking outside of the box and not setting on the first solution they find. They enlist outside help from open minded people. Another article about problem solving talks about how Being a good problem solver means that we need to determine root causes of problems and kill that root. The more we do this, the less problems arise as we are dealing with root causes instead of simply just treating a symptom. Then we should go about measuring how successful our solution was and if it was truly the correct one. True problems solvers are prepared to be wrong when trying to solve a problem and then learning from their mistakes and course correcting. If we can identify the underlying issues behind the problem, we can go about solving it in a much more effective and time efficient way, allowing us to present the best solution possible. Leaders set goals and go after them hard. They persevere through all odds to reach those goals. Without goals we are just drifting around. It is like a ship without a captain. We have the ability to achieve massive levels of success in this life, but without goals we can never use this vessel that we call the human body to it’s full potential. They key here is that leaders set goals that stretch themselves. Within the big goals they set, they also set smaller checkpoint goals on the way to their big goals. They chip away and chip away each day, taking consistent action until they finally achieve what they set out to do. The reason leaders are goal setters is that you cannot become a leader unless you have goals and accomplish them. This is because we need to exercise self mastery before we can master the art of leading others. Until we work on self-mastery, we can never have the wherewithal and mindset it takes to lead others to their own victories, show them their full potential or even reach our full potential in a leadership role. Reminds them of important concepts – They also reread books in order to be reminded of these concepts and keep them at the forefront of their thoughts so that the can implement them into their personal and professional lives. New and thoughtful ideas – They read insightful books in which they can be seen as outside the norm or of their scope in order to broaden their sense of mindset into their current profession to help them bring more value on a larger scale. Encourages better decision making – It provides us access to experiences that aren’t our own and how others approach problems. This gives leaders different options to make better decisions in their life. They can see it from other peoples point of view and use that knowledge so they don’t have to reinvent the wheel. The article also talks about how there is a correlation between the 1200 richest people in the world, they are all readers. So now that we understand the power of leadership and reading. I mean the man himself Warren Buffet – Reads 500 pages a day and used to read up to 1000 pages a day when he first became an investor. Bill Gates reads 50 books a day! Now of course what you are reading matters, but what it really comes down to is developing the habit of reading. Read books about leadership as well as how to develop the attributes I have talked about in this article. Good leaders are intuitive. Bill gates is quoted as saying: “Often times you have to rely on intuition.” But intuition more of a art instead of a skill, which is often misconstrued that people are shooting from the hip when using it. Usually women are better at listening to their heart and gut buy the quality of using your intuitive senses can be developed and honed in the more it is used. Motivated to act by their inner vision. This trait cultivates power shift that comes from someone operating off of personal value and meaning which enables them to see solutions that others can’t. Setting trends not following them as following trends bores them. They let go of things easily when they are no longer working for them which lets them create new action plans for moving forward. They let the people on their team thrive and contribute. This creates trust and connection within the team that creates an innovative environment for everyone. They ask better questions. For example instead of simply asking how can we make more and do less? They ask questions like “how can we serve people in a more enlightened way?” They ask better questions because it leads to better answers. Journaling – Writing what comes to your mind, without judging it, can help you develop better intuition. It is a stream of consciousness to where logic isn’t getting in the way of tapping into your intuitive power. You can ask questions to get this process going with questions like “What do I need to know?” and “What do I think the best decision is?”. Paying attention to our dreams because they often offer deeper messages. Our dreams are an accumulation of internal stress and suppressed feelings along with our hearts longings that can show us what we truly desire. Paying attention to sudden feelings. Shifts in mood, or quick feelings of uneasiness can be your gut talking to you. Learn to ask yourself what this shift in mood means and you will start to get answers from you higher self. Also, don’t fight these urges or try to suppress them, learn to allow them to be fully present. Meditate and simply ask a question that is on your heart and wait for an answer. Some call this the still small voice within. When it come down to it, good leaders are excellent at time management. They are awesome at maximizing the hours of the day, keeping the candle burning under them to remind them that time is precious. Once you and I get into a rhythm of conquering the hours of the day, we can bring that to our organization, family or people you are looking to lead. We can rise to the heights we desire if we are wasting time. Good leaders use the Pareto Principle to a tee, knowing that 20% of their actions are vital and the other 80% are trivial. And they master their using these numbers. But time management is just one aspect of self leadership. It also comes down to knowing and understanding their emotions and processing those emotions effectively in order to move forward efficiently. They also read others feelings and are in tune to their environment. A great article titled “Leading By Example: A Guide To Self-Management” talks about how when it comes to self-management, a lot of it encompasses learning to be productive. It means creating a task priority list and meeting them accordingly. It is also about self control in which one who masters their emotions in stressful situations. We know ourselves so deeply that we can literally be the conductor of our emotions. We get out of victim mindset and move into being the master of our fate and the captains of our soul. Initiative is also a big part of self-management. Where we do whatever it takes to create a future for ourselves and the people we lead and do so with integrity and composure. At the end of the day very good leaders leave no stone un-turned. They get as many facts as they can in order to make the proper decisions to lead themselves and their team forward. They take on things and finish them with relentless pursuit. Mix this with the qualities that I spoke of above and you have the recipe for leadership and self mastery. I really hope you enjoyed this article and got value from it! Share with me what your favorite quality was, what your opinions about the article as well as if you have anything to add in the comment section below!